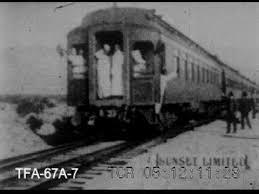 While this could be seen as a simple remake of “Arrival of a Train at La Ciotat Station” or for Americans, “Black Diamond Express,” it is also a bit of a demonstration how far movies had come in the short time since those films. While it does depict a train pulling onto the screen and rolling across it, there is more going on here. For one thing, the prominent placement of a sign informs us that this is a deliberate advertisement for the “Sunset Limited,” a train whose name was intended to draw moneyed tourists from the cold North to spend their winters in sunny California. The Edison company catalog emphasized this point as well, proclaiming that the movie offered “special inducements to winter travelers.” The landscape is obviously as important as the moving train to the cameraman, so we get a pleasant Western vista in the background. The people standing by the side of the tracks are not mere spectators, either, but seem to be aware of their roles as actors before the camera, making a point to wave as the train rolls by. Finally, we are treated to a primitive editing technique, for once the train rolls offscreen to the left, a sudden jump occurs and a new train comes on, heading to the right along the same track. Run Time: 1 Min, 24 secs.